Glenn is Brenda's son and Junes brother. He started his dance training at Armley Dance from a young boy to 18 years old. He then attended Rambert Dance for 3 years then was accepted into the company where he stayed for 19 years - one of the longest standing company members to date. After this he was Head of Performance at Northern School of Contemporary Dance in Leeds. He then returned to the West End - London in 2007 to work on Lord Of The Rings, the musical where he was dance/fight captain. He went back to Rambert in 2008 as rehearsal director/Artistic Associate. Glenn then went onto join Dirty Dancing, the musical as Resident Choreographer on the London show then Associate Choreographer on the UK tour. Glenn is now working as Resident Choreographer for Billy Elliot the Musical and Choreographer of Sinatra at the London Palladium. He is also a Contemporary Dance Mentor on BBC1s BBC Young Dancer Programme. 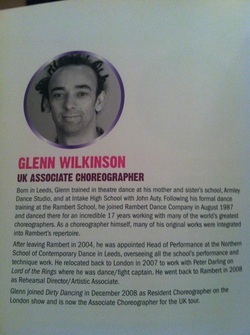 Glenn currently teaches freelance at Royal Ballet School, Rambert School of Ballet & Contemporary. After finishing her training at Armley Dance Studios she secured her first contract with Danze Fantasy in Hong Kong. Since then Emma has gone from strength to strength with a very successful career in the Arts industry, West End credits - Chicago the Musical (Lead/Velma Kelly), The Producers the Musical (Lead/Ulla), The Stripper (Lead/Deadpan Dolores), The Beautiful and Dammed (Lead/Madame Ergova), Simply Cinderella (Lead/Coral). Other UK and International credits include - Emma Bunton, Maybe (featured dance) Delovely the Movie (featured dancer) Children In Need 2005 & 2006, Ant & Decs Saturday Night Takeaway, Top of the Pops, Parkinsons' Christmas Special. Modelling credits - WEN Haircare, Mauritius Tourist Board and Big Dug. Now Emma resides in Los Angeles,USA where she has credits such as - The Birth Mother, The Good Drunk, Thanks for Coming and more. Emma is also a recently published author with her informative book "Paid To Dance" available on Kindle now. Zara attended Armley Dance Studios from 4 until 18. Taking part in competitions Zara won lots of IDTA regional titles in Modern, Tap and Ballet and gained an IDTA scholarship in Modern Jazz. At 18 Zara toured in Mallorca with a caberet show. Following this Zara gained a place at La Nouvelle Eve, Paris where she made her Paris showgirl debut. A year later Zara joined the cast of the prestigious Parisian caberet show Bonne Huere at the Lido, Champs Elysses and has just been in a documentary that is available on DVD now Danse avec Papous. Zara has just renewed her contract at the Lido Paris as part of the brand new Franco Dragone Production. Billy was a student at Armley Dance from age 5 to 18. Billy won lots of regional IDTA championship titles and also won the prestigious title of Master Dance of Great Britain 2009. After completing his dance training he then went on to study a BA Hons Degree at Circus Space, London. Whilst here students have to chose a discipline, Billy was the first student to study Cyr Wheel. After his degree Billy is now the UKs Leading Cyr Wheel Artist. Cyr Credits - Royal Albert Hall, Queens Jubilee, Adidas, Range Rover (Victoria Beckham, Evoque), Britains Got Talent LIVE Semi - Finalist, Cirque Du Soleil/Fedec Documentary, Palm Atlantis (Dubai) and many more. Acro/Dance Credits - 4music, Matalan, Ford Motor Show (Geneva). Billy is based in London working freelance internationally. Billy was one of the professional performers for BBC1s "TUMBLE" with Celebrity partner Lucy Mecklenburgh. Billy has currently been working on the Volvo Ocean Race travelling the world. He has also done various commercials for TMobile, Lebara Mobile and Mens Health UK most recently. Fay trained at Armley Dance Studios from 3 years old until 18 studying all core subjects and gymnastic dance. Fay won various IDTA regional championship titles and gained IDTA scholarships. At 18 Fay began her professional career in Portugal at Casino Estoril performing as an Aerialist in Four. She then progressed to Lead Rope Act in Visions at Casino Estoril. Completing 2 full shows in Portugul she moved onto Casino De Perla, Slovenia where she performed in Magic of the Orient. Fay then joined the Princess Cruises family dancing in their production shows onboard the Grand, Golden and Star Princess. After Princess Cruises Fay has been working freelance in London where she has worked for Coke Zero, Guinness World Records, Skyfall premiere, Ministry of Sound, Blundell Street Studios and many more. Fay successfully finished a year of working in London and joined celebrity Cruises as part of the Aerial Quad onboard Celebrity Eclipse. Followed by a 6 month contract in the 360 show Evolution in Shenzhen, China as part of the inaugural cast. Fay in now finishing up a contract again onboard Celebrity Eclipse as part of the Aerial Quad and is looking forward to joining the Armley Dance Teaching Faculty on returning to Leeds. Since starting her training at Armley Dance Studios Melissa won many IDTA regional championship titles.At the age of 16, Melissa joined The Hammond School. Since gaining a BA (Hons) Degree in Professional Dance, Melissa has gone on to do many prestigious corporate events and commercial work all over the UK, alongside dancing for Royal Caribbean International for the past 6 years. Whilst travelling extensionally all around the world, Melissa has also had the chance to perform in Broadway review shows and professional Ballroom and Tango shows and also held the roles of dancer, tumbler and aerialist. Ross is both a talented dancer and singer. He won many regional IDTA championship titles including the North East Of England Senior Modern and many more. 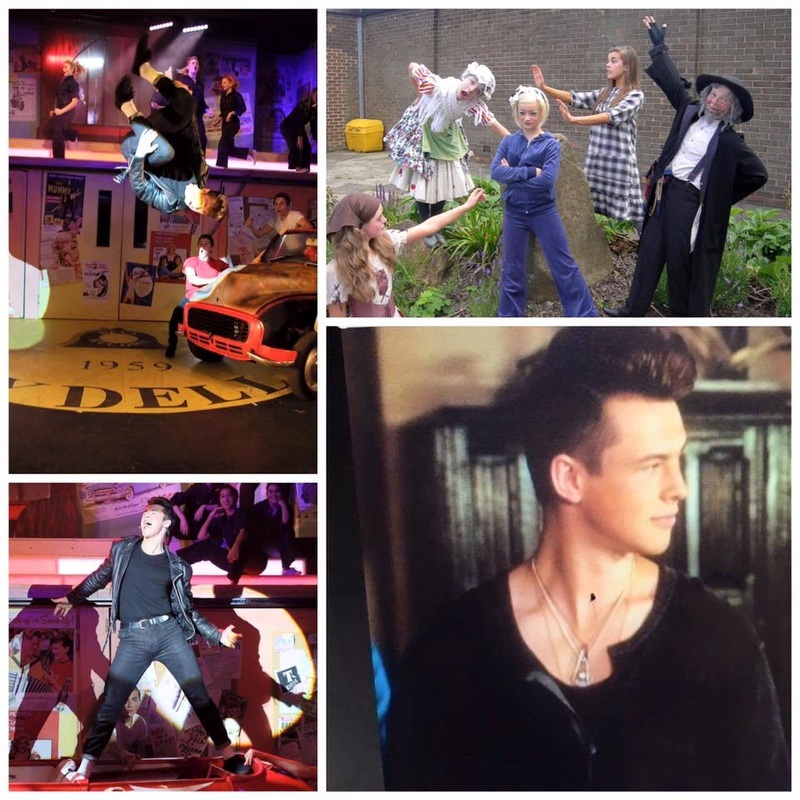 After finishing his training at Armley Dance Studios, Ross went on to study at The Urdang Academy for three years gaining a 2.1 degree BA (HONS) in Professional Dance and Musical Theatre. 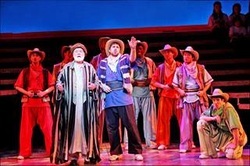 Ross has just joined the cast of the UK national tour - Joseph and His Technicolor Dreamcoat playing the part of Isaiah. Natalie attended Armley Dance Studios from the age of 5 until 19. She gained places in IDTA Tap and Ballet Championships, winning 1st place in the West Yorkshire Junior Ballet at the age of 10. Natalie was also awarded two scholarships for the IDTA Senior Tap Grades. After leaving Armley Dance she secured a two year contract in Weston Super Mare, Sandbay Leisure Resort where she gained valuable dance life experience. 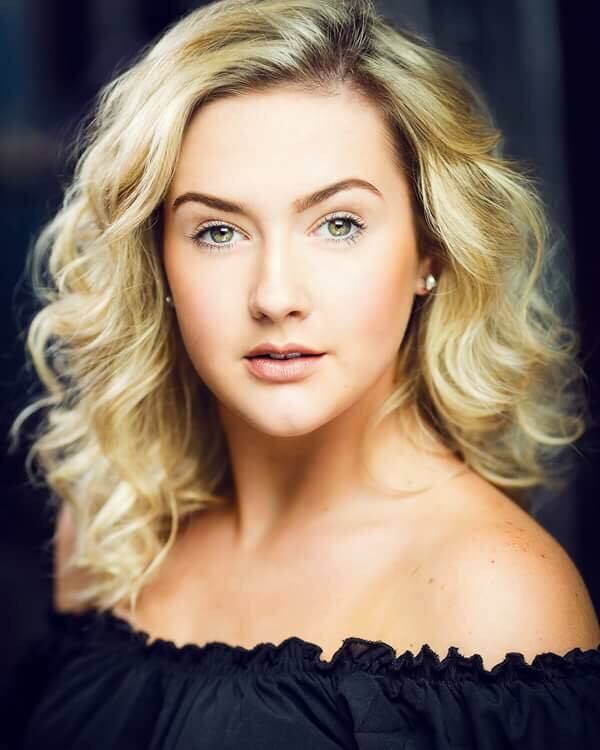 Natalie then moved on to a touring caberet show around Zante and Corfu and is currently enjoying the dancers life hoping to continue in this career. Katharine attended Armley Dance Studios from the age of 11 taking classes in all subjects. Katharine gained places in IDTA Modern Dance championships. She was nominated for an IDTA scholarship in Modern Jazz Grades. Also Katharine reached the Finals of Miss Dance of Great Britain twice - one year walking away with the highly acclaimed Singing Award. Katharine then successfully auditioned at Arts Ed Theatre School and attended for three years gaining a BA HONS in Musical Theatre. She was very lucky to land her first professional job before even graduating,playing IRIS in the ensemble of 'High Society' at The Old Vic, she was also 1st cover DINAH, onstage swing and Assistant Dance Captain. Katie swiftly moved into the touring cast of "Hairspray" the musical after "High Society" playing BRENDA and cover AMBER. Katie was Swing Dance Captain in Big The musical in Dublin and is making a very exciting debut in 42ND Street at the Drury Lane Theatre, London opening Spring 2017. Ben danced in all the competitions for Ads and what a talent he had from acting, singing, gym and tap championships to name a few. He went into the Uk Tour of Chitty Chitty Bang Bang and then into the West End in Oliver. From there he went to Sylvia Young Theatre School on a full scholarship. At 16 he was the only boy to be given a scholarship for PA at Hurtwood House. It's here while performing in their show he was spotted by an agent and in 6wks was signed by Disney for the lead role in a teens series called Evermoor Chronicles playing the lead role "Iggy"
Chloe trained at Armley Dance studios from the age of 7 years old and began competing at championship level at the age of 10. From here Chloe went on to take numerous championship titles in ballet and modern. Chloe also competed in the Miss Dance of Great Britain, qualifying for the Blackpool final a total of 5 times, ranking in the final 6 four times and being awarded 3rd place and Runner Up. On completion of her English Literature degree Chloe embarked on her first professional dance contract as a production dancer on board the Cunard Queen Victoria. On this vessel Chloe completed a world voyage and is looking forward to dancing her way around the world again aboard the Cunard Queen Elizabeth in 2017. Charlotte Radcliffe an ex pupil just gained her first professional 12 month contract as a singer/dancer on the Thompson Sprit Cruise Liner. Charlotte always loved singing and dancing and joined Ads at 9. She had many successful competition places, plus championship positions. She performed at the International Theatre awards in both ballet and tap. At 16 she auditioned for the famous Italia Conti Academy of Arts and gained a place on a full Dada award for her training. In July 2016 she graduated. All the best Charlotte on your very exciting contract well deserved. Your passion for performance was always evident along with your brilliant singing skills.